The MMW series power modules are low-profile dc/dc converters that offer up to 30 watts of output power in a 2 x 1.6 x 0.37 inch package. 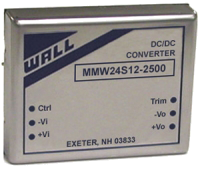 These converters operate over input voltage ranges of 10-40VDC and 18-75VDC. This series also provides regulated single and dual output voltages. Other features include remote on/off control, output trim function, six-sided shielding, and efficiencies up to 89%. All models are over voltage, over temperature and short circuit protected. The EN55022 Class A conducted noise compliance minimizes design time, cost, and eliminates the need for external filter components. These converters are best suited for data communication equipment, mobile battery driven equipment, distributed power systems, telecommunications equipment, mixed analog/digital subsystems, process/machine control equipment, computer peripheral systems, and industrial robot systems. Dimensions: 2in. × 1.6in. × 0.37in. 2. 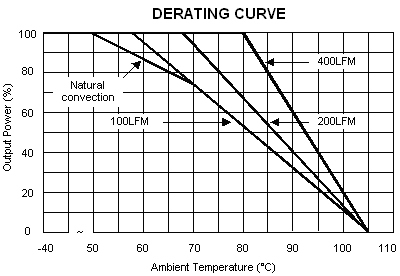 The MMW series requires a minimum output loading to maintain specified regulations. Operation under no-load conditions will not damage these devices, however they may not meet all listed specifications. 5. 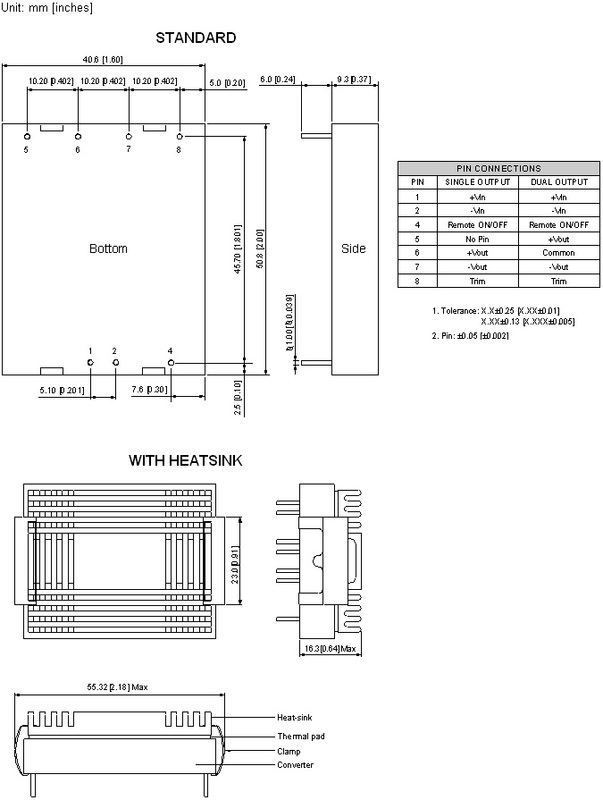 Heatsink is optional. Please call factory for ordering details.